Jeremy Thiel: Swinging In The New Year! Kettlebell training is one of my true loves. I ordered my first set 4 years ago from http://www.dragondoor.com/. I received a 16kg 24kg 32kg in that order. The 32kg sat on my parents back porch for over a year due to the lack of ability to use it. I ordered a couple of books and went at swinging the 16kg. 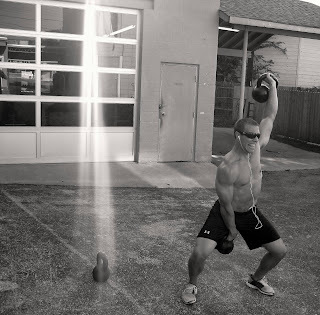 4 years later Crossfit Central has started its first kettlebell classes. Please come out this Saturday at 1030am for a free kettlebell workout at Crossfit Central.